I sewed this in less that an hour, and it turned out pretty cute. I took one of my husband's t-shirts that he wasn't wearing anymore, and modified it into an off-the-shoulder top. 1. 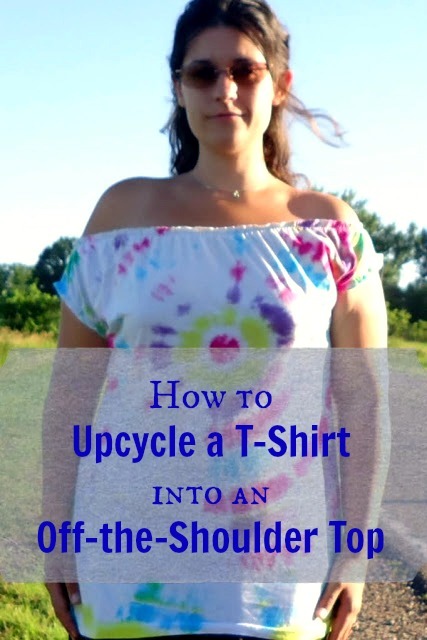 Cut off the top of the t-shirt at the tops of the sleeves and across the chest. 2. Cut off an inch or two from each sleeve. 3. Put narrow hems in to finish the edges of the sections you cut off. 4. If you'd like, you can bring the sides of the shirt in somewhat so that it has a more fitted look, and cut some off the bottom if you'd like the shirt to be shorter. 5. Measure yourself around your shoulders. Take that measurement, and subtract 2" from it. This will be the length of the elastic for the top. 6. Measure your upper arm, and subtract 1". Cut two pieces of elastic to this size for the arm holes. 7. Use pins to mark the off-the-shoulder top into quarters. Mark the sleeves the same way, and mark all 3 pieces of elastic by quarters. This is so you stretch the elastic far enough while sewing; you will match the pins up as you go along. 8. I used the elastic stitch on my sewing maching, but zig-zag would work fine too. Start stitching the long piece of elastic onto the inside of the off-the-shoulder top, pulling the elastic as you go to line up the pins you used as markers. Do the same with the 2 smaller pieces of elastic and the armholes.